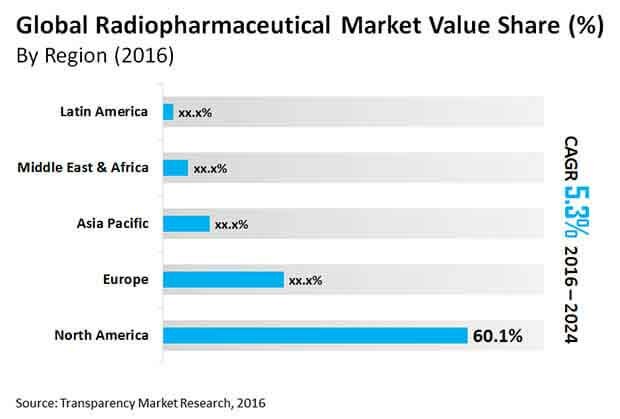 A recent study by Transparency Market Research (TMR) has detected that the global radiopharmaceuticals market is consolidated in nature with two companies, GE Healthcare and Siemens Healthineers, holding 70% of the market in 2015. Radiopharmaceuticals make for an evolving market, which is attracting a number of other leading pharmaceutical players with technological capabilities and high production capacity. As a result, the competition is expected to get even stiffer in the near future. The TMR report projects the global market for radiopharmaceuticals to increment demand at a CAGR of 5.3% during the forecast period of 2016 to 2024. According to the evaluations of the report, the global radiopharmaceuticals market was worth US$4.7 bn in 2015, and estimates it to reach a valuation of US$7.4 bn by the end of 2024. Acquisition of niche players is the primary strategy adopted by these leading players to expand their geographical presence, while adopting new methods of production and robust sales support are other modes of maintain their stronghold over the market. For instance, AAA acquired GE Healthcare S.r.L’s FDG-PET business recently, after gaining full shares in Imaging Equipment Ltd. (IEL) in 2014. With these moves, the company has significantly strengthened their presence in the U.K., Italy, and Ireland. On the basis of source, the report segments the global radiopharmaceutical market into nuclear reactors and cyclotrons, and rates the former as slightly more profitable market segment than the latter. End-users of radiopharmaceutical market analyzed under this report are hospitals, diagnostic centers, ambulatory surgical centers, and others. Hospitals continue to serve significantly more demand, although technological advancements is poised to increment ambulatory surgical centers segment quickly during the forecast period. On the basis of radioisotope, the report categorizes the global radiopharmaceutical market into technetium-99, iodine-123, 18F, gallium-67, yttrium-90, rubidium-82, and lutetium-177. Among these, technetium-99 accounted for 50.3% of the demand in 2016, although the report projects 18F segment to exhibit the most prominent CAGR of 5.5% during the forecast period of 2016 to 2024. Application-wise, the report rates oncology as most profitable, while the segments of cardiology, immunology, and nephrology are also poised for healthy growth in the near future. Some of the key factors driving the global radiopharmaceutical market are: continued preference of radioisotopes for the diagnostic imaging, glaring benefits such as targeted therapeutic irradiation that have fewer side effects, easy detection of metastatic sites, positron emission tomography (PET), prevalence of cancer, and growing number of diagnostic, chemotherapy, and screen centers. On the other hand, strict regulations pertaining to the production and storage of radiopharmaceuticals is hindering the market for radiopharmaceutical from attaining its full potential.